Audiobus is a new iOS app that allows you to pass the audio output from one app to the input of another in real time by creating an inter‑app 'audio cable'. For those of us who have persevered with AudioCopy (and AudioPaste) and the iOS clipboard to shuffle audio between different apps, this might just be the godsend we've been waiting for! Funkbox and Soundprism Pro as Audiobus inputs, Loopy HD as output. Soundprism Pro with the Audiobus connection panel visible on the right-hand side. 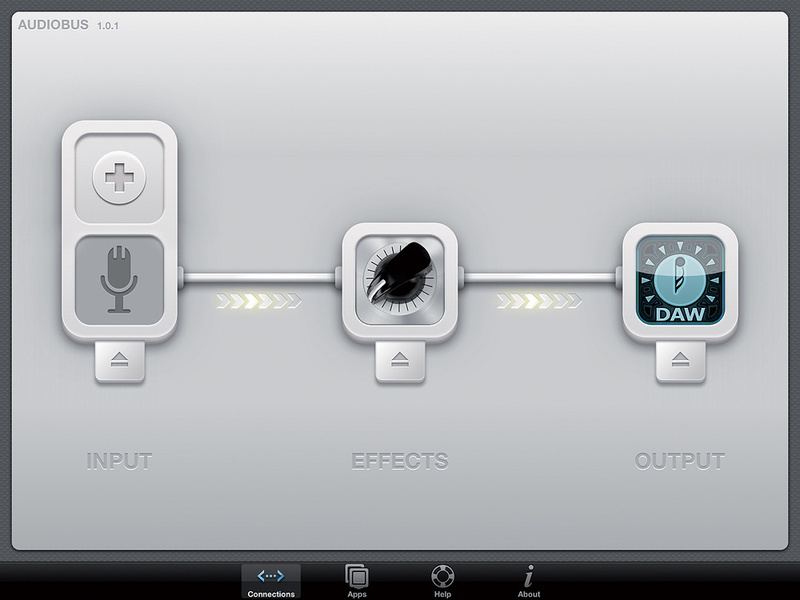 Guitar recording into Multitrack DAW with effects from JamUp Pro.Trailed in Apple Notes back in July 2012, Audiobus has undergone extensive beta testing and is now available on the App Store. The catch is that apps must be Audiobus compatible, which explains the long gestation period, as those apps have to undergo testing at the same time! The list is much more extensive now than it was back in July, with some significant additions. See http://audiob.us/apps for the current list, which is growing daily. Once I had a selection of compatible apps installed, I decided to test Audiobus with two typical scenarios. The first was recording synthesizer apps. For this test, I used Funkbox and Soundprism Pro as the input apps (sound sources) and Loopy HD as the output (recording device) as shown in the example screen. 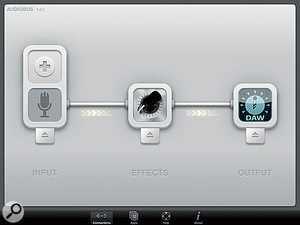 Setting up was very straightforward: the input and output apps can be launched from Audiobus itself, and there's a connection panel that allows you to switch between apps quickly. You can also activate recording to the output app without leaving the input app, and stop and start playback of the input app (if it has a sequencer or is a drum machine) without leaving the output app. The interface has been thoughtfully designed to make this a straightforward process. Recording worked without a hitch and I was very quickly able to create a multi-layer piece using Loopy HD, and even synchronise the two apps using MIDI clock via Core MIDI, to record perfect two-bar loops from FunkBox. For my second test, I made a multitrack guitar recording with effects. I connected a guitar to the iPad using an Apogee Jam interface, and then selected 'Microphone Input' as the input in Audiobus. This automatically selected the Jam, although it was connected to the dock connector. I then added JamUp Pro to the middle 'Effects' position in Audiobus, and, finally, selected Multitrack DAW as the recording device in the output position. With this setup, I was able to record guitar with effects from JamUp Pro straight into the Multitrack DAW app, again without any hitch. The future widespread adoption of Audiobus is entirely dependent on other developers adding Audiobus support to their apps. The only competition to Audiobus at present is Sonoma Wireworks' AudioCopy/Paste protocol, although this works in a very different way. AudioCopy has proliferated and works with GarageBand (probably the most popular iOS DAW) and allows users to create music by 'collecting' contributions in various apps and pasting them into a project in GarageBand. Much as I love Loopy and respect the austere minimalism of Multitrack DAW, compatibility with an app like GarageBand is imperative if Audiobus is not to become marginalised. Two important players, WaveMachine Labs (who develop Auria, the most complete DAW for audio recording for iOS at the moment) and Moog Music are working on Audiobus compatibility as I write, and the SDK will be released to the public in the near future, all of which bodes well for the future. 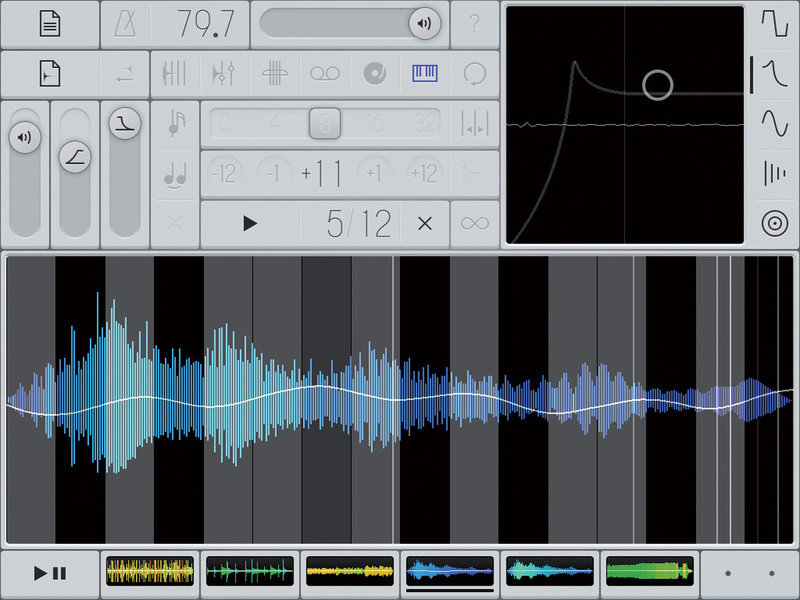 Samplr is a modestly-named app for sample and loop manipulation. 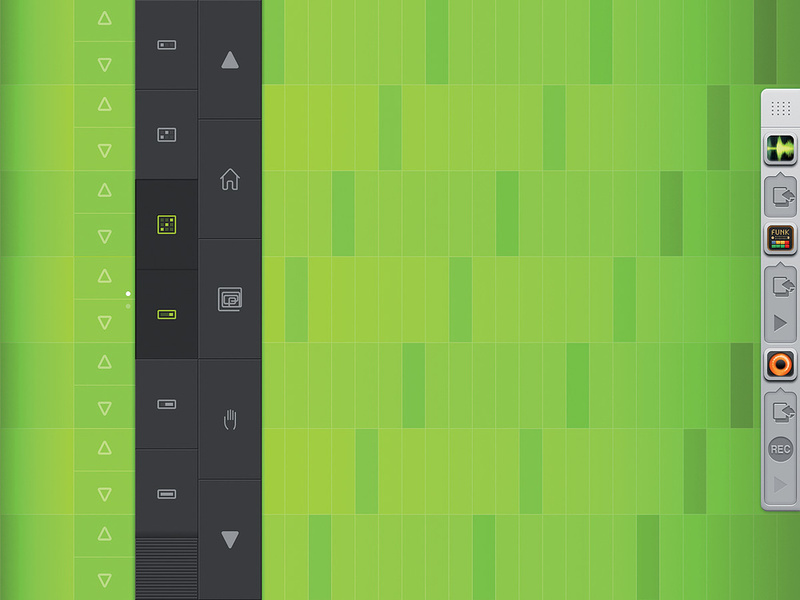 Its graphics and even some of its behaviour are reminiscent of Teenage Engineering's OP1, but Samplr is no copycat. For a start, it's notable for making superb use of the iPad's multi-touch surface to stretch, transpose, play and twist up to six samples, each with six note polyphony. Samples can be loaded while others continue to play, so you can introduce loops, ambient effects and instruments without ever stopping. In tape playback mode you set the volume, direction and speed with your finger. These gestures can be recorded. Select any sample by its icon in the lower part of the screen. 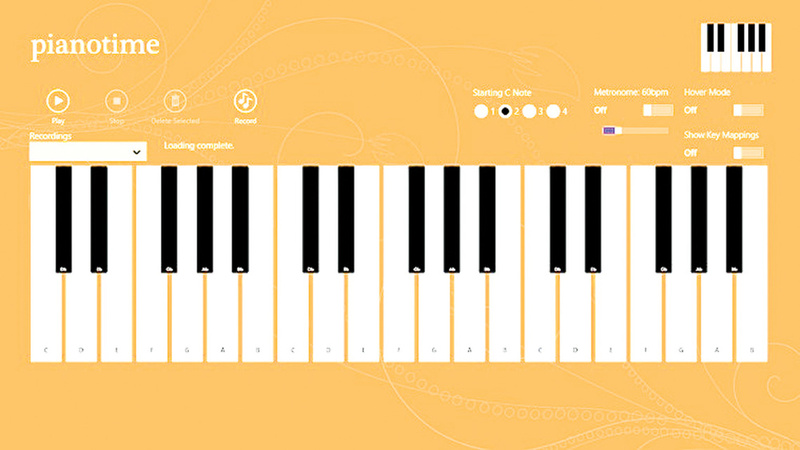 In Keyboard mode, samples or portions of samples are played chromatically.The large 'playing area' consists of a waveform view designed for performance, with polyphonic gestures fully recordable over a maximum of 128 bars for each sample. The available playback modes are: Slicer, Looper, E-bow, Tape, Scratch, Keyboard and Loop Player. All have their own unique flavours and controls, plus you can switch the playback mode at any time. For the maximum creative buzz, gestures recorded in one mode continue to play when another is selected. I can't recall any experience of triggering and interacting with samples that feels more instantly natural than Samplr's screen-stroking. The actions available vary according to mode, but in all modes other than Loop Player, the vertical axis of the playing area corresponds to volume. Samples can be reversed at the press of a button and have a simple attack/release envelope. Then there's a rather neat central control combining pitch-bend and transposition, its range an impressive plus or minus four octaves! Already there's a stack of features perfect for ambient electronica, but grooves aren't left out. Click the 'fit to tempo' button and the sample length is adjusted so that it fits the project tempo, and although tempo isn't automatically detected, the existing method of specifying the number of bars and time signature works well. Let's look more closely at the seven play modes. 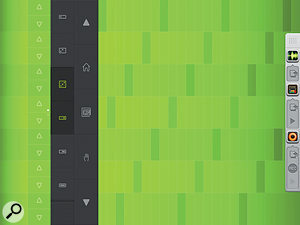 In Slicer mode, you tap the screen to play individual sample slices. A preset slicer carves out up to 32 equal chunks, but it's easy to add your own points manually and move them around or delete them. There's a fun shuffle option that randomly shunts the playback head amongst the slices, all of which amounts to a highly entertaining way of manually reshaping any loop. The next mode along is Looper, in which fragments of the sample are looped according to the position of two fingers. As the fingers draw close together, near-granular tones are created, and if the fingers cross, playback switches into reverse. The same idea gets a different implementation in E-bow mode. It's polyphonic, so instead of setting the loop length with two fingers, you get a slider. In this mode, you can unearth playable tones in pretty much any sample source, which is totally Fripptastic! Tape mode has more than a whiff of Teen Spirit. OK, it isn't quite the tape recorder of the OP1, but the position of your fingers influences the sample playback speed, with a smooth progression from slow reverse through stopped and original speed, ending up at a rousing quickstep. In a slight variation, Scratch mode puts the playback speed directly under your fingers. Alternatively, you can set playback to its fixed speed and instead use your fingers to set the point(s) where playback starts and its (or their) direction. In Keyboard mode, you play samples or a selection within a sample chromatically. Activate legato and the slide between notes becomes smooth-flowing and natural. Which brings us to Loop Player mode, an easy one: it loops the sample at the project tempo. That little lot is a full and, most importantly, accessible toolkit — but there's more. Each sample has five effects, and there's a set of master effects over everything. A Kaoss-like window sits in the right-hand corner, inviting manipulation whenever the mood strikes. The effects are Distortion, Filter, Amplitude Modulation, Feedback Delay and Reverb, the X/Y axis handling the most useful parameters for each. Korg released the original Polysix in 1981, when it went head-to-head with Roland's Juno 6 for keyboardists who wanted a cheap programmable polysynth as an alternative to the prohibitively expensive Prophet 5 and Jupiter 8. Thirty-one years later, we now have the iPolysix app for iPad. It's not a cheap app, but it's certainly cheaper than sourcing an original (and fixing the failed key contacts!). Does it do the original justice? iPolysix's main interface. 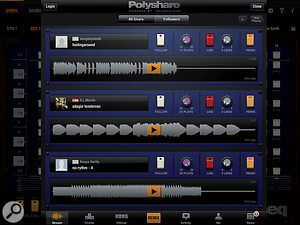 Polyshare: Korg's SoundCloud community for iPolysix users.The iPolysix faithfully recreates the original's architecture, which had six VCOs, one for each of its six voices. These six voices could be played polyphonically, or stacked in unison mode, and the iPolysix does a good impression of that massive polysynth sound. You can also access another Polysix party trick in the Key Assign Mode section: tap the Hold button in Poly mode to stack up to six different notes, then tap Chord to assign your choices to the chord memory. You can then play back the memorised chord by triggering it at any pitch. The interface, as in the original, offers control over VCO, VCF, modulation generator, envelope generator, arpeggiator and effects, and usefully offers 50 presets as well as a handy 'Init Patch' preset so you can program from scratch. iPolysix's default keyboard has 37 notes, which of course have very narrow keys to fit them onto the iPad screen! Tap the button at the bottom left of the keyboard to reveal the optional keyboards of varying width, and the small switch labelled 'Kaoss Pad'. 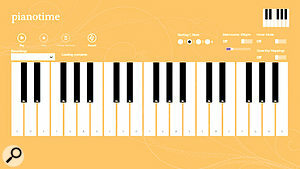 Two pads are available: the left-hand one can be assigned to any two parameters on the synthesizer, and the right-hand one is an alternative note input device, from which a range of preset scales and keys can also be chosen. So far, so good: it's like a Polysix with some modern additions — but I should voice a complaint at this point. Recreating the look of the classic analogue synthesizer doesn't always recreate the feel, and those rotary controls are particularly fiddly. I discovered that micro-changes could be made by flicking up and down (and left and right for even finer adjustment), but I would struggle to make any timbral edits in a live situation without a magnifying glass! And why are the Kaoss pads so small? Surely it would be easy enough to add a full-screen option? iPolysix also incorporates a step sequencer with which you can program up to 32 discrete patterns, each with between one and 64 steps. A song can contain up to 100 of these patterns in any order. Additionally, each pattern can include two sequences (which have to be of the same length, of course) played by independent synthesizer patches, and one drum sequence, greatly increasing your creative options. The drum sequence can contain up to six independent drum parts, the patches for which carry through the whole song, but do include the option to use a small range of pitched basses. Synthesizer patches are assigned per pattern, however, so it is possible to create complex-sounding music with up to three pitched parts and drums playing simultaneously. When you've finished programming, iPolysix offers a range of sharing options. 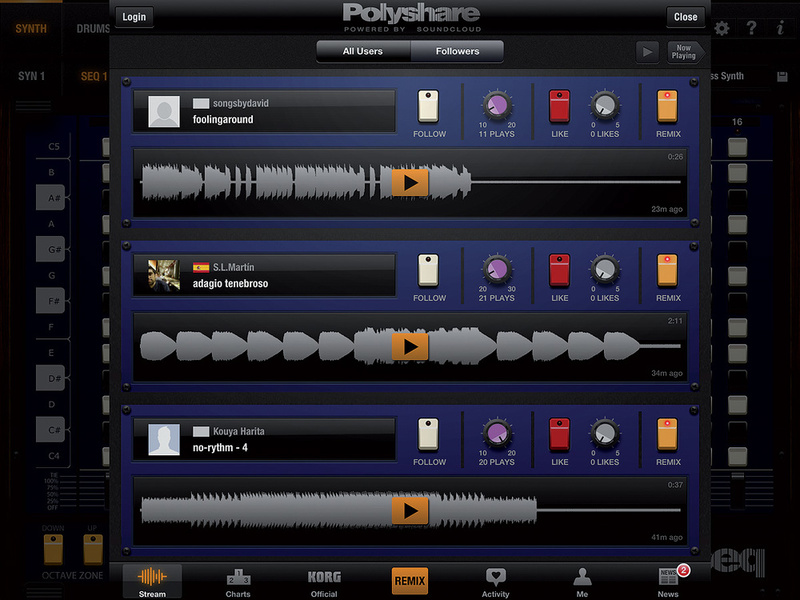 You can upload to your own SoundCloud or 'Polyshare', which is a SoundCloud space specifically for iPolysix users to share and comment on each others creations. You can render to .WAV file, which is then accessed via iTunes file sharing on your Mac, or use AudioCopy, which places your mix on the clipboard, making it accessible to other apps that support the audio-paste half of this protocol, such as GarageBand. iPolysix also supports WIST, Korg's own inter-app performance and sync protocol. I was, however, slightly disappointed not to see a virtual rendition of the original Polysix's cassette-tape dump facility!